The hotel is running a special B&B rate for attendees, and loads more information is available on their webpage – link above. 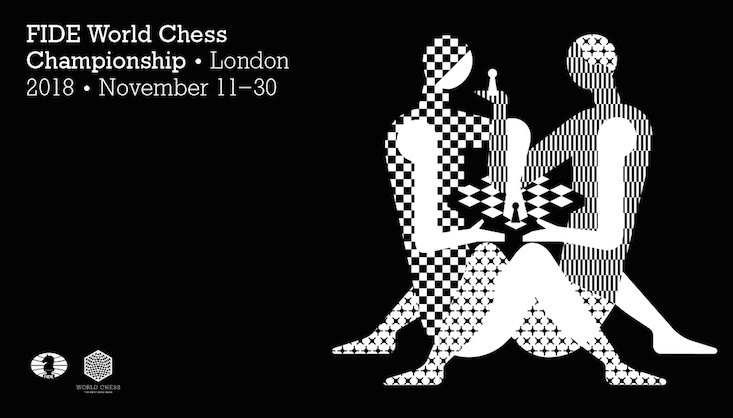 Hammersmith Chess Club presents… a trip to the FIDE World Chess Championship in London! Members will be attending Round 5 – the eagerly awaited contest between reigning World Champion, Magnus Carlsen, and his younger contender, Fabiano Caruana, on Thursday 15th November 2018 at The College in Holborn, Central London. Further details are available from Dipender Gill (dipender.gill@imperial.ac.uk), who is organizing the Hammer visit! Friends & partners welcome! 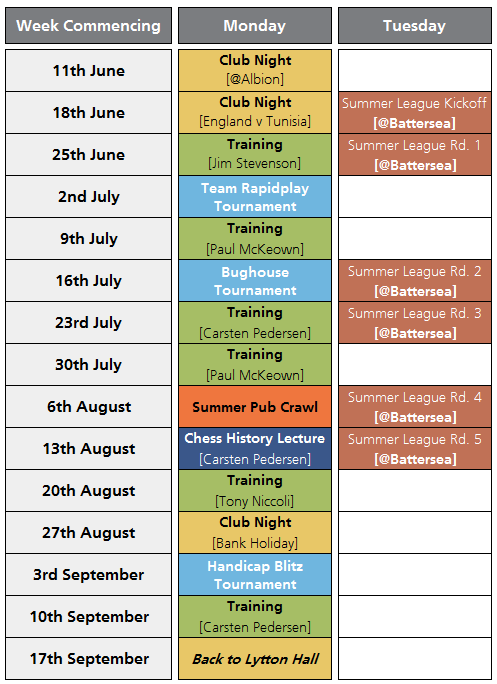 A special Prize-Giving night for the Summer League will be held on Tuesday the 28th August at Battersea Chess Club – and you are all invited! Various trophies will be presented to the winning teams, but more importantly – the ceremony will be followed by a mass (free) blitz tourney! It’s going to be epic!! Please indicate to your Hammer SL captain if you wish to participate so we can get our logistics in order for the evening. Many thanks! This coming Monday 20th August evening sees Hammers Tony “The Tiger” Niccoli hosting a training evening at The Albion. He’s a qualified ECF coach, and his last few training sessions have been top notch – we expect this one will be brilliant too! As always, it’s free to attend and all are welcome (inc. non-members!). 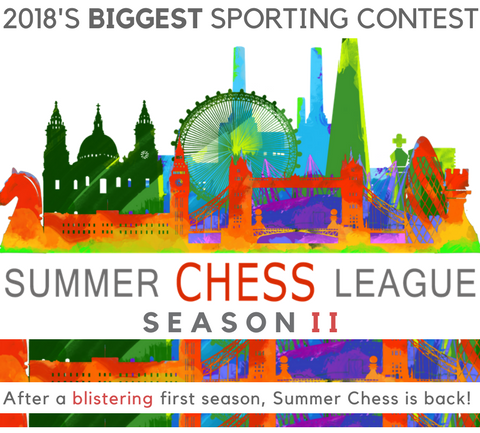 The Summer of 2018 keeps on giving – just like your favourite chess club in West London. Are you tired of heat, sunshine, chess and beer? Then Hammer has the perfect antidote… more of the same. Yes, Hammer is a devotee of the hedonistic Creed – if it doesn’t kill you it must be good. Hence, that superb event the Summer pub crawl with, wait for it…. chess. This year we go North to escape the sun. This year’s festivities commence this coming Monday 6th August, at 7pm. 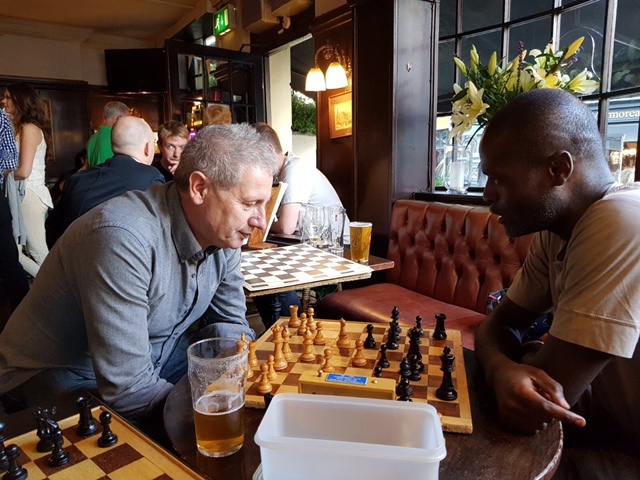 Previous editions of the Summer Pub Crawl – chess & beer – perfection! The night kicks off at The Albion at 7pm where we shall assemble. At 7.30pm chess sets/boards in hand we will commence our night’s Odyssey. You can join at anytime but to get the best from the evening you need to do the whole craic. There may be a competition – there might not be – it’s that kind of evening. 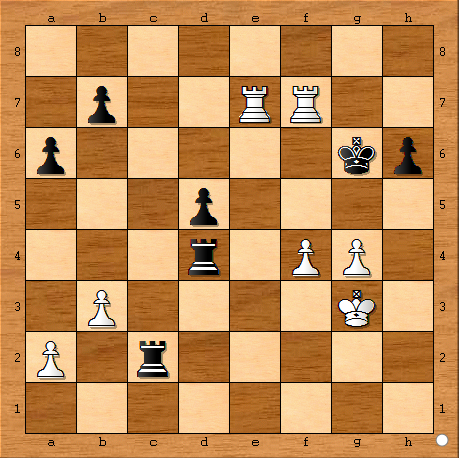 All I can say is the quality of chess generally deteriorates through the evening, but the imagination soars! One thing that also improves is the conversation – so true Hammers, I call you to assemble and have fun. See you tomorrow!! I am John White, and I fully endorse this message and recognise it as a genuine product of the John White Drinking Club.